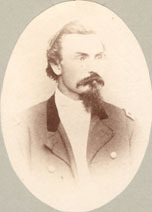 We met Civil War Brevet Brigadier General Elias Wright (1830-1901), a Captain in Company A, 4th New Jersey Volunteer Infantry Regiment, who fought in the Peninsula Campaign, Second Bull Run, South Mountain, Fredericksburg, and Chancellorsville, and who went on to serve as Colonel of the 10th United States Colored Troops at the Battle of Fort Fisher. 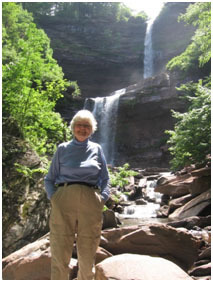 Betsy described his contributions to South Jersey, including his 30-year collaboration with Joseph Wharton that resulted in his comprehensive survey of the initial 96,000 acres that formed the nucleus of today’s Wharton State Forest, the state’s largest forest. Originally a native of Durham, New York, he married Julia Ashley of Port Republic in 1855, lived in Weymouth Furnace, Elwood, Batsto, and finally Atlantic City where he died. Betsy Carpenter, a long-time resident of New Jersey’s Pinelands National Reserve, has served as Public Programs Coordinator for this State’s Pinelands Commission, and today continues as a historic researcher and freelance writer. This entry was posted in Meeting archive on January 13, 2014 by hlj. This entry was posted in Meeting archive on January 12, 2014 by hlj. This entry was posted in Newsletters on January 10, 2014 by hlj. In the mid-1800s Octavius Valentine Catto blazed new trails for equal rights for people of color. Modern day heroes such as Martin Luther King, Rosa Parks, and Jackie Robinson would walk in his footsteps more than 100 years later. 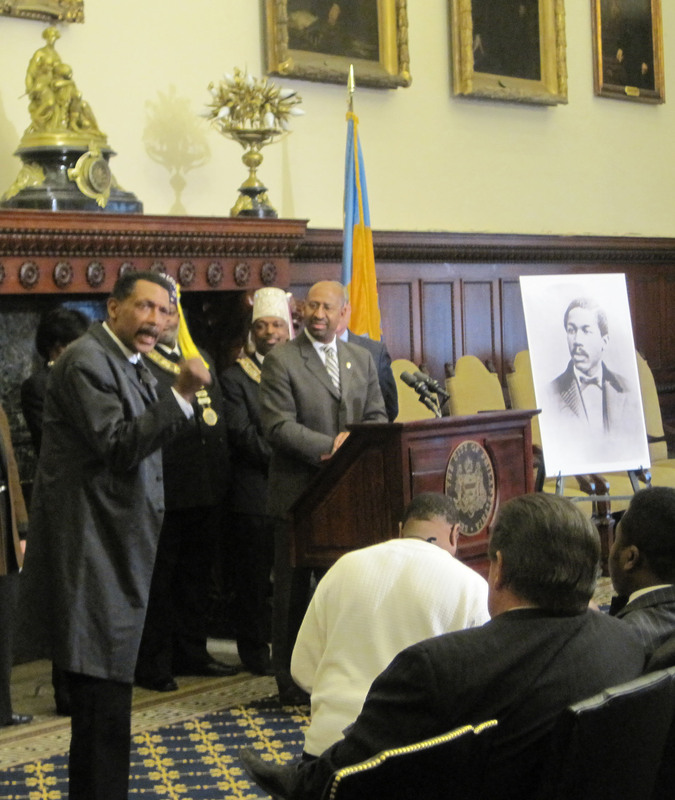 Although Octavius Catto lived a full and dramatic life in Philadelphia, too many Philadelphians have never even heard his name. Until now. W were introduced to one of the most inspirational leaders of all time. Robert Branch is a native Philadelphian who earned his Bachelor of Science degree for mechanical engineering from Swarthmore College. He won the Innovator award from the Electric Power Research Institute for his work in foundry sand reclamation. He later spent over ten years working with disadvantaged children in South Africa, where he was named Volunteer of the Year. Upon his return to the U.S., he decided to pursue a career as a performer. 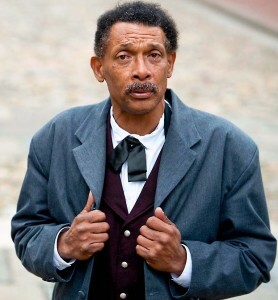 He works as a historic interpreter, storyteller and tour guide. Robert Branch portrayed Octavius Valentine Catto during Mayor Nutter’s press conference to announce the city’s contribution toward a project to erect a statue at City Hall in Catto’s honor. Robert has also performed Catto to support diversity initiatives at PNC Bank, law firms, universities, and schools. This entry was posted in Meeting archive on January 9, 2014 by hlj. Bruce Sirak of Burlington Twp., NJ, is a founding member of the Camp Olden Civil War Round Table, named for New Jersey’s first training camp during the Civil War. When Bruce was 10 years old, his family visited Gettysburg, where he learned about one of the greatest battles ever fought on American soil. That vacation inspired him to develop a strong interest in the Civil War era, an admiration for patriotism, and great appreciation for all United States veterans. Now he is not able to put down any book about U.S. history, and he has expanded his interest in history to include all world wars. The Gloucester County Historical Society will be presenting Paddy Has Gone for a Soldier on Thursday, January 23, 2014, at 7:00 pm in the museum. This unique musical program will be performed by Mike Plunkett, a member of the Libby Prison. The program will consist of songs and stories of Civil War Soldiers, with particular emphasis on the Irish Brigade. 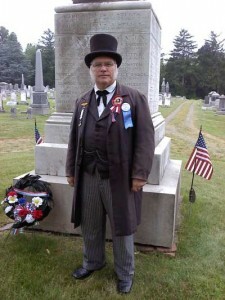 Mike has performed this same program at Gettysburg National Park and the National Museum of the Civil Was in Harrisburg, among many other venues. Admission to the program is $5 per person, members free. Please call the museum ahead to reserve a seat: 856-848-8531. Admission includes an optional tour afterward of the museum’s current exhibit: The Civil War: Echoes of New Jersey’s Finest. The museum is located at 58 N. Broad Street, Woodbury, NJ 08096. Free parking is available on site. This entry was posted in News on January 8, 2014 by hlj. The David Library is partnering with the National Endowment for the Humanities (NEH) and The Gilder Lehrman Institute of American History to mark the 150th anniversary of the Emancipation Proclamation by presenting Created Equal: America’s Civil Rights Struggle, a month-long program designed to encourage citizens to revisit the history of the civil rights movement, and to reflect on the ideals of freedom and equality that have helped bridge deep racial and cultural divides in the United States of America. Civil War military units, civilians, and heritage groups are welcome and encouraged to march in the parade through Philadelphia to Independence Hall to honor President Lincoln on his birthday. Participants will gather in the McMichael Room of the Union League, 140 S. Broad St. by 11am. Convenient FREE parking available for participants near the Union League prior to 10:30am. This entry was posted in News on January 7, 2014 by hlj. Featuring noted historians Ralph Peters and Tom Huntington, other speakers, and authors on General Meade and the Civil War, as well as books, prints and raffles. Cost: $40 per person including registration; luncheon & refreshments. Honoring the great Black civil rights and military leader. Wreath-Laying ceremony. All military units, period civilians, veterans, and heritage groups are encouraged to participate. Colors, wreaths, and music encouraged. This entry was posted in News on January 6, 2014 by hlj.